For many children and teens, climbing is a natural inclination - from trees to playgrounds to that boulder in the backyard. MetroRock is the largest venue in Vermont for kids to follow their inner monkey and take to the walls! MetroRock is proud to offer youth camps for the next generation of climbers, ages 5 to 18. 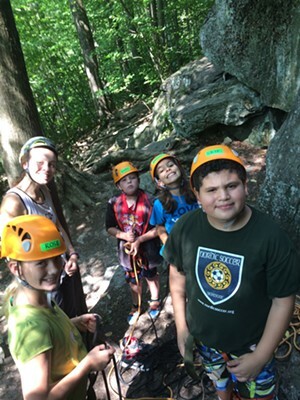 We are proud to offer indoor and outdoor summer camp options that include a balanced blend of climbing, safety instruction, and team building. Through this instruction we foster a spirit of adventure and a love for the sport of climbing. Learn more here!